MUAR, May 31 (Bernama) -- Deputy Prime Minister Tan Sri Muhyiddin Yassin is to meet the Registrar of Societies (ROS) Monday or on Tuesday to find who the legitimate president of the People's Progressive Party (PPP) is. He said Prime Minister Datuk Seri Najib Tun Razak, just before flying off to South Korea today, had asked him to meet the ROS to find out whether Datuk M. Kayveas or Senator Datuk T. Murugiah was the president. Najib is scheduled to open the PPP general assembly on June 7 and "if we do not have a decision (on who the PPP president is), we do not know whether he will attend the meeting," Muhyiddin told reporters after attending a religious ceramah (talk) organised by the Pagoh Umno Division, here. Muhyiddin, who is Umno deputy president and Pagoh Member of Parliament, said Murugiah handed him a letter claiming he was the PPP president when the latter met him at the Royal Malaysian Air Force base in Subang, Selangor, where Najib flew off to South Korea to attend the Asean-South Korea Commemorative Summit. The PPP leadership crisis erupted after Murugiah, who was sacked by the party's disciplinary board for allegedly tarnishing the good name of the party, claimed he had been elected the president at an extraordinary general meeting convened by a section of party members last Sunday in Putrajaya. However, when the PPP nominations for the post of president closed yesterday, Kayveas was said to have been returned unopposed as president for a fourth five-year term. Asked whether the leadership crisis in the PPP, a component party of the Barisan Nasional (BN), tarnished the BN's image, Muhyiddin said crises in any component party should be resolved swiftly to maintain the coalition's image. He said it was important for the component parties to avoid differences of opinion among them and resolve crises swiftly at a time when the BN was restoring its image. "The BN must be seen as a strong and stable coalition," he said. KUALA LUMPUR, May 30 (Bernama) -- People's Progressive Party (PPP) "new president" Senator Datuk T. Murugiah said today he expected to be able to recruit 100,000 new party members by the end of the year. Murugiah, who chaired his first supreme council meeting today, told a news conference that he already had around 50,000 interested individuals who would be joining the PPP and that 15,000 of them came from Johor alone. "The entrance fee and membership fee for the first 100,000 new PPP members will be waived. As the new PPP president I will ensure that all the PPP branches will be updated and I also plan to open new branches throughout the country. "Tomorrow, I will visit Perak to explain to party members the current situation and I will continuously visit party members throughout the country on a recruitment drive and to explain to everyone as well," said Murugiah. On who was the rightful president of the PPP, Murugiah said he would allow the Registrar of Societies (ROS) to resolve the issue. Murugiah had declared himself the "new PPP president" following an extraordinary general meeting (EGM) held last Sunday in Putrajaya, thus plunging the party into a crisis and prompting a probe by the ROS. Meanwhile, in a separate development at the party headquarters in Jalan Kampung Attap here today, Datuk M. Kayveas was returned unopposed as PPP president for a fourth five-year term. The party had earlier sacked Murugiah and he has until midnight today to file his appeal for reinstatement. KUALA LUMPUR, May 30 (Bernama) -- Datuk M. Kayveas was today returned unopposed as the president of the People's Progressive Party (PPP) for a fourth five-year term. In his victory speech soon after the results of the nomination were announced by an independent non-party returning officer, at 1.20pm, Kayveas said 99.9 per cent of the total 500,000 members were united behind him and it was "just this tiny 0.1 per cent" that was causing some problems. "The PPP is strong and will become stronger in the days ahead and overcome all challenges," he told cheering supporters gathered to hear the results. Kayveas was apparently referring to the challenge by supreme council member Senator Datuk T. Murugiah, a deputy minister in the Prime Minister's Department, who had declared himself the "new PPP president" following an extraordinary general meeting (EGM) held last Sunday in Putrajaya, thus plunging the party into a crisis and prompting a probe by the Registrar of Societies (ROS). The ROS only recognises Kayveas as the rightful president pending investigations into the alleged non-compliance of party rules and regulations. "We are making arrangements to keep the office open until then for him to appeal," Kayveas said. "I assure him that the party would consider his appeal fairly. However, if he fails to appeal by the deadline, he would be considered sacked," he added. Kayveas also announced to the jubilant supporters that the Prime Minister's Office had confirmed that Datuk Seri Najib Tun Abdul Razak would officiate the PPP general assembly on June 7. Nine members are contesting the three posts of vice-president while 29 are contesting the 25 seats on the supreme council. Nominations for all the posts were conducted in an orderly manner and there were no untoward incidents as feared earlier. All nomination papers were closely scrutinised before being accepted. On allegations that he was not eligible to hold the president's post because he was fined RM5,000 by the Bar Council in 2005, Kayveas said the alleged offence was non-criminal and that he had appealed against it and was awaiting a response from the Bar Council. "Disqualification only refers to conviction in a court of law for criminal cases and it is obvious that I have not committed any criminal act to have me disqualified," he explained. Kayveas advised Murugiah and his supporters to "stop disturbing the party" and let it continue to carry out its task of serving the people. "We are confident that we will be able to work hard in the next few years and ensure a big victory for the Barisan Nasional in the next general election," he said. Later, at a press conference, when asked about Murugiah's position as a deputy minister if he failed to appeal, Kayveas said: "I do not want to jump the gun. We will wait until midnight to take the next course of action." Bernama understands that moves are underway to pass a resolution at the general assembly calling on the prime minister to replace Murugiah with another nominee from the party. A total of 2,200 delegates will be eligible to cast their votes at the assembly. 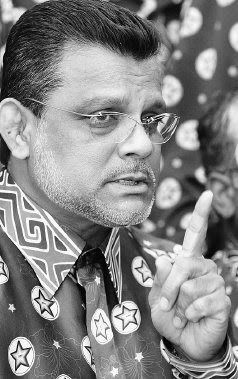 PUTRAJAYA: The People's Progressive Party's (PPP) saga has intensified with a new allegation levelled against its president Datuk M. Kayveas. Yesterday, representatives from the sacked Senator Datuk T. Murugiah's camp made their way to the Registrar of Societies (ROS) here to report on Kayveas' ineligibility to hold the post he had held since 1993. Spokesman Dr N.A. Shanmuganathan said as Kayveas was fined RM5,000 by the Bar Council on March 17, 2005, under Section 103D of the Legal Profession Act 1976, by right he should not be allowed to hold office. The prohibition, Shanmuganathan pointed out was outlined under Section 9a(1)(b) of the Societies Act 1966 which says that a person convicted and fined no less than RM2,000 or imprisoned not less than a year under the country's laws, is disqualified from holding any position in a registered society. At a press conference at the ROS head office's lobby, Shanmuganathan produced page 61 of the Bar Council's March/April Infoline magazine, in which Kayveas was cited for legal action. 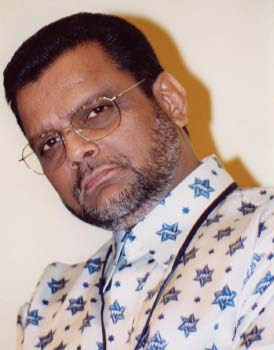 In the 2005 PPP election, Kayveas retained his presidency unopposed. "Although he was fined in 2005, he did not wait five years or till 2010 to recontest the post. "He did so, knowing very well that he had lost his eligibility to keep his position. "His presidency is therefore null and void," Shanmuganathan said adding that any chances of Kayveas defending his president's post would only be after at least five years from the date his punishment was meted out under the law. KOTA BARU: Money politics is breeding an ugly power tussle, threatening to ruin the People's Progressive Party (PPP), said its president, Datuk M. Kayveas. Embroiled in a power tussle with supreme council member Senator Datuk T. Murugiah, Kayveas feared that the multiracial party could become the victim of an external power play. "I won't rule out the possible involvement of external elements in this recent problem in PPP. "Sometimes, people don't like it when you're vocal. It is not acceptable to some top people. "I guess you have to pay a price when you're too straightforward among party members and outsiders. It's okay that they throw the punches. We will take the blows." Speaking to the media after officiating the inaugural Kelantan PPP convention here yesterday, Kayveas said rather than solving the differences, Murugiah's actions were further plunging the party into other conflicts. PPP, a component party of Barisan Nasional, plunged into crisis after Murugiah, who is also deputy minister in the Prime Minister's Department, and several other leaders were expelled by the party's disciplinary board recently. Murugiah was elected as the "new PPP president" at an extraordinary general meeting (EGM) held in Putrajaya on Sunday, prompting a probe by the Registrar of Societies (ROS). The ROS, however, only recognises Kayveas as the rightful president pending an investigation into allegations of non-compliance to the ROS' rules and regulations. Kayveas revealed that three of those who were expelled for their role in organising the illegal EGM had contacted him and expressed remorse. "They want to appeal against the decision but they're a little apprehensive that the others may not agree with them. I shall keep their identity a secret but I call upon them to do what is right for the party. It is not about me but the party. "If they have problems they should voice them out at party level and not express them through the press. Just come forward and let's discuss them," he said, yet again offering an olive branch to the disgruntled faction led by Murugiah. Earlier in his speech at the convention, Kayveas said the way forward for politics in this country was the eventual migration towards a two-party system. Sacked PPP supreme council member Senator Datuk T. Murugiah is safe — for now. The party will not take any action against him, at least until the Registrar of Societies has completed its investigations into allegations of non-compliance with the ROS’ rules and regulations. 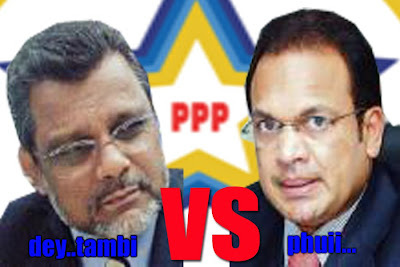 PPP president Datuk M. Kayveas said the party wanted to be fair to its former leader. 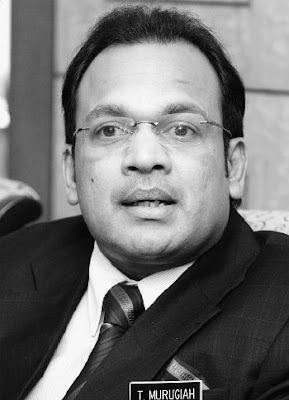 PPP, a component party of Barisan Nasional, plunged into crisis after Murugiah, who is a deputy minister in the Prime Minister’s Department, and several other leaders were expelled by the disciplinary board recently. Murugiah was elected as the “new PPP president” at an extraordinary general meeting last week, prompting a probe by the ROS. Kayveas said yesterday that Murugiah did not appeal against his sacking before the midnight deadline yesterday. “As of today, he’s a deputy minister without a party. He’s on his own,” he said, adding that Murugiah’s government post will be dealt with after PPP’s annual general assembly on June 7. He warned Murugiah that the party can take action against him if he continued to “damage” the party. “He is no longer a PPP member and if he does any more damage to party, there are provisions in the Societies Act to deal with him,” he said.